Sometimes, you just need to step out of your comfort zone and take on new challenges. The Bay of Fundy International Marathon was one such time for me. Where I live it is almost impossible to have any hill training, so going to run a marathon that has 2400+ feet of elevation gain through non-stop rolling hills is certainly a giant step away from my comfort zone. I thought I was mentally prepared for the challenge, and in all truth, this race could have been the most miserable of times if a few stars didn’t line up for me and help me readjust to a different race day experience than what I was used to. While I didn’t ‘enjoy’ the hills of the race course, this ranks among my favourite races for so many reasons. And it is one I would highly recommend for a seasoned runner who wants a real challenge – or for a runner who simply wants an uplifting race experience. Stopping at the Bangor Police Dept on the way to Lubec. Follow their Facebook page if you don’t already. In 2017, the fifth Bay of Fundy International Marathon took place the last weekend of June. 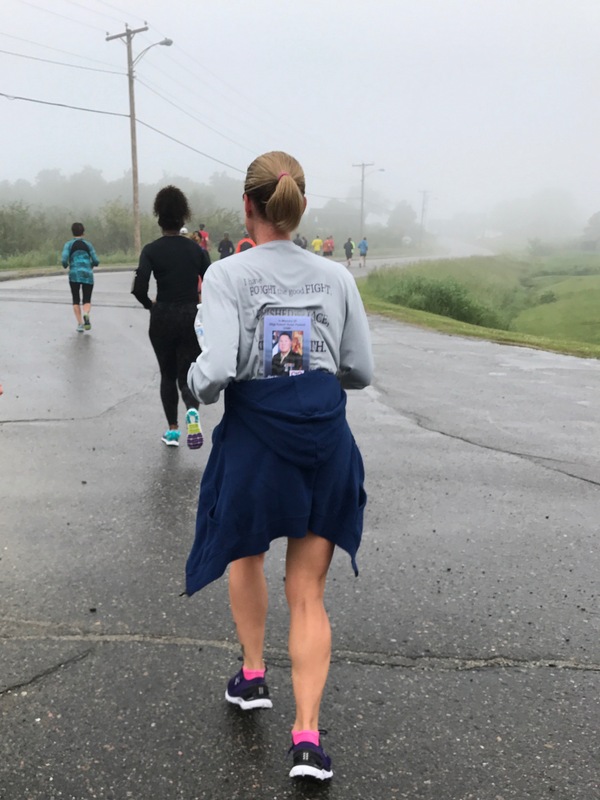 It is a cross-border marathon, where runners start in Maine, run into New Brunswick, Canada, and after a tour of Campobello Islands, cross back into the US to the finish line in Lubec, Maine. This was also the third time they ran the half marathon (starting in Canada and ending in Lubec), and the first year for an ultra-marathon option (52K or 32.5 miles). None of these courses is for the faint of heart. The hills are real, and while none of them are outrageously long, they are constantly coming at you. I don’t recall a truly flat stretch at any point on the course. Almost a year ago, my friends Lashell and Sharon, and I decided we wanted to have a girl’s weekend/race-cation. Our initial plan was to run the Adam’s County Marathon/Half Marathon event in late September 2017; to our dismay, that event announced it would not be held following the 2016 event. So we started looking at other options that worked with all our schedules and met the need for both half and a full marathon options. I have always wanted to see the Bay of Fundy, with its incredible high and low tide phenomenon (up to 60 ft differential in some places! ), and when I realized this race was a possibility, I threw the idea out to the group. I don’t think anyone really looked at the elevation profile beforehand. Thankfully. Clearly the Bay of Fundy was the race we chose, and we all registered in November 2016, when registration opened. This area is small, so once you plan to attend, it is to your benefit to reserve accommodations before they sell out. We found a fantastic cabin rental through VRBO (Haven of Rest), and felt like we were set for our race weekend. We all flew into Portland, Maine, and rented a car to drive the four hours to Lubec. (Bangor is another option for flights, and is a two hour drive to Lubec, but it was significantly more expensive.) This is not the most convenient race to get to, but it was worth any logistical maneuvering. And with a group of friends, the laughs started at the airport and lasted the length of this trip. We arrived very late (after midnight) and in the fog, so we couldn’t see more than a few feet in front of our face. It made for an interesting arrival to the cabin, which was tucked in the woods. Waking up the next morning for the shakeout 5K showed that the fog hadn’t lifted, so we didn’t fully appreciate the view from our back deck. Luckily, this was all sorted later on Saturday, and we could see the water (and mud, depending on the tidal cycle) stretching beyond the trees as it receded into South Bay. There was an informal shakeout run at 8am on the Saturday morning, with runners meeting at Cohill’s Inn on Water Street. Lubec is not a large town, so this was very easy to find. Parking was available at the boat launch area, which was across the street. The owner of Cohill’s Inn is a runner, and it looks like she was leading the run. After trying to enter through the wrong two doors, we finally found the correct entrance to stand inside, avoiding the drizzle and cold temps for a few more minutes until we took off. The leaders took us on a little tour of Lubec to give us ‘a taste of the hills’ that was to come on race day. We ran a large loop on the outside of the town, including along a pebble beach and boardwalk system, then up and down more hills than I thought to count, ending with a smaller loop on the inside of the town and finishing back at Cohill’s Inn. It was a challenge, I won’t lie. I wasn’t about to push it too hard because my legs needed to be ready for 26 miles of hills, so I came back in one of the last runners in our small group. Warm up complete, we headed back to the cabin to shower and proceed to bib pick up. Bibs in hand; we’re ready! Bib pick up is a unique experience; you get your race packet/shirt on the US side of the border, then pick up your bib on the Canadian side. To do this, you must get clearance at each border station (passports required!) and tell the agents you are a runner. They check you off their list, and then your bib essentially serves as your passport for the actual race. Rather clever, isn’t it? This process, which sounded complicated on paper, was very smooth and seamless. We were all smiles at this part of the race experience (who isn’t? ), loving our long sleeve shirts – blue for marathon and white for half marathon -and proudly posing with our bibs for the requisite photo. We went back to Lubec once this was completed and did some shopping and had a light lunch (well as light as a bowl of buttery clam chowder could be). As runners, we were welcomed by almost everyone we met in the town. Clearly this was an exciting weekend for two small communities, and they made no apologies for extending tremendous hospitality to those who were visiting for the race. 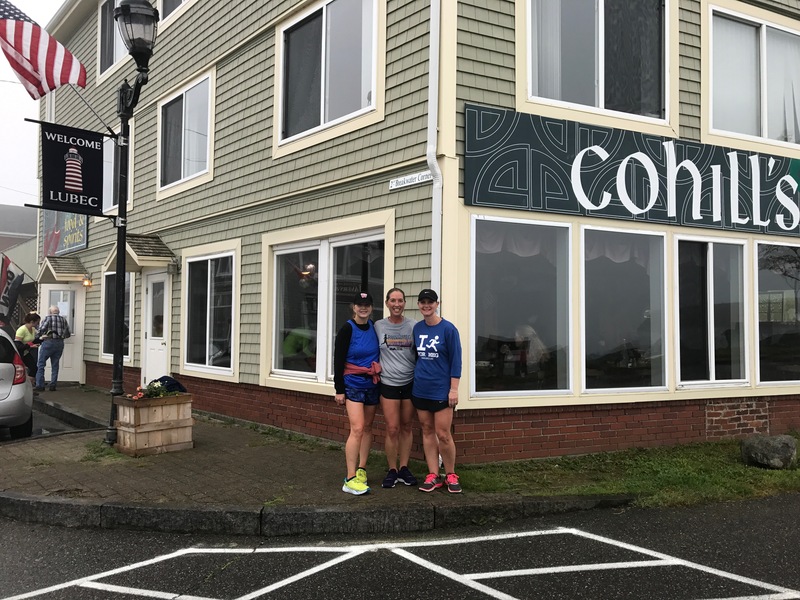 Looking back, I genuinely think that if people in Lubec and Campobello Island were not volunteering at the race, they were spectating and cheering runners on – that is how much these communities embraced this event. Never have I felt this level of welcome at a race or in pretty much any other travel experience I have had. Our final sightseeing stop was the West Quoddy Head Lighthouse, which is the easternmost point in the US. There are some information cards and a brief movie about the lighthouse inside, which took a few minutes for us to peruse before we snapped final photos of the landmark and headed back to the cabin. The fog had been clearing throughout the afternoon and had completely lifted by the time we headed out for dinner. During registration, I opted for the pre-race lobster (lobstah) dinner for $22. There was also a pasta option for $15, which included spaghetti. But when in Maine and Canada, you go for the fresh lobster. 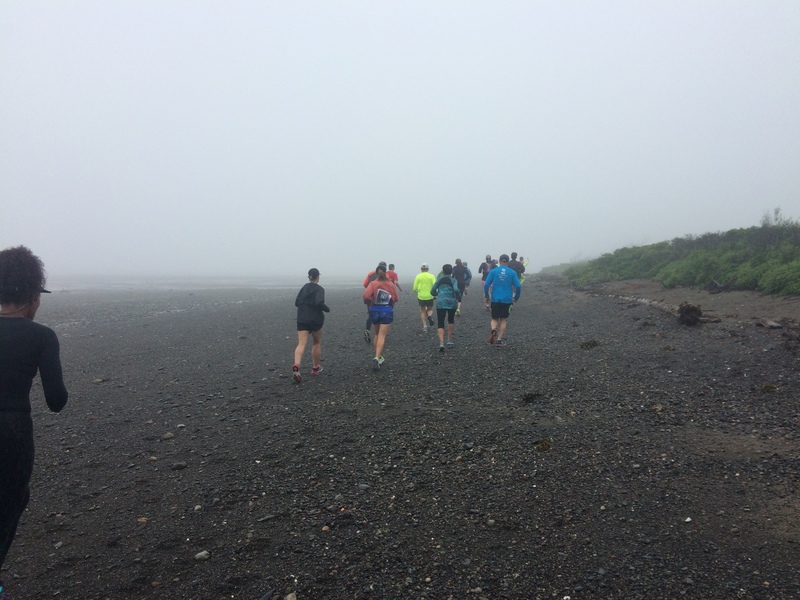 This dinner, which was actually open to more than just the runners (you could pay as you walked up, with all funds supporting JDRF), was at Herring Cove in Campobello Island. So back across the border we went and drove to We sat at a table where we luckily had expert instruction on how to properly eat our lobster by a local. I wasn’t full on this dinner (and I couldn’t stomach the pasta salad and potato salad), so I went back and asked for a small portion of spaghetti (I made a $5 donation as this was not part of the lobster dinner cost). The lobster was good, but deep down, I’m a blue crab girl and always will be. After finishing our dinners, we drove to the final stop of the day, the East Quoddy Head Lighthouse, which is the turn around point for both marathon and half-marathon runners. This lighthouse is accessible for about an hour before and after the low tides of the day. To get to it, you have to park your car in the lot then go down a ladder and walk across a pebble beach, up a ladder, down a ladder and across more rocks before you get to the main attraction. It was slippery. Sharon wisely decided to not go far; Lashell and I were simply praying that we didn’t slip and twist our ankle as we traversed the seaweed covered rocks. But we made it, got a few photos and headed back before we got trapped at the lighthouse with the tide starting to come in again. I don’t think Sharon would have waited six hours to come back and get us again. We made our final race day preparations and headed to bed as early as we could. That alarm clock would go off far too soon. What I didn’t really realize due to the fog the previous morning is that the sun comes up around 4am. So whether I liked it or not, I was awake starting around that time. The marathon started at 7:10am, but to access the start, we had to catch a bus at the Lubec school by 6:15am. Sharon and Lashell graciously got up early for my start (their buses left between 7-7:15am for their 8am start time), wishing me well as I rode to the West Quoddy Head Lighthouse. Upon arrival, the sun was warming up the area rather quickly and I knew it would be a warmer than expected race day. This seems to be my pattern in 2017. I met up with Deb, who is a friend of a runner I met on the Bermuda marathon course in January. We did a few photos, chatted and cheered on the ultramarathoners, who were entering mile seven at this lighthouse, where they then would run the marathon course. After singing the national anthems for both Canada and the US, the cannon went off and the race was on! Most people say that the flattest part of the course is the first miles of the marathon, until you get to the Roosevelt Bridge leading into Canada. Then the fun begins. I was running a faster pace than I wanted to the first four miles, so I made a conscious decision to slow it down. The closer we got to the border, the more spectators we saw, which made it harder to maintain a slower pace. But I knew the hills were ahead, so I did my best to keep it around the 10 min/mi pace. I did stop to do a photo as I crossed the border, telling the US border agents that I couldn’t wait to see them again (which simply meant that I would only have about 0.1 mi left to go), and off I went. The Canadian agents were among the most enthusiastic spectators on the course (both times I crossed their station); they were high-fiving runners, cheering and had a nice little squad of agents offering encouragement to the runners, welcoming us into Canada. At this point, we were slapped in the face with the first hill. Then another, then another. You get the picture. The hills didn’t stop coming. When you got up a hill, you thought it would go down, only to see a slight decline which headed toward another uphill. It made me laugh and I slowed my pace a little more to about 10:15/mi to try and conserve energy for as long as possible. One thing that helped tremendously was when we started seeing the half marathoners (and the speedy marathoners and ultra marathoners) going in the other direction. I believe I started seeing this when I was about three miles into Canada, and I did what I could to offer words of encouragement to those I passed. So many of them also took time to call out encouragement to me. And so it went for this entire out and back. I’ve never experienced this level of support from runners at a race, and it was one of the things that I will always remember about running Fundy. I was pretty happy that I ran for about 11.5 miles before I had to take my first walk break. But after that it was a shift in how I could possibly finish the 15 miles I still had left. My walk breaks at first were short and I would pick up the pace into an easy run for long stretches. As I continued on, my walk breaks got longer and my running stretches slowed down. Thankfully, when I knew it was going to be a very disappointing run, I ran into Katy, who was on a walk/run strategy as well. She and I had passed each other several times on the course already, and when we realized we may end up doing this the whole race, we decided to join forces and run/walk together. Which was probably the single most important decision I made to ensure I had a positive experience. Sometimes you are just fortunate to meet the right person at the right time; Katy is a very experienced marathoner (this was her 41st) an she also lives where it is flat – so limited hill training. We had a couple hours to get to know each other and share the course. Her positive attitude and experience helped me to quickly overcome any disappointment I may have felt at having to run a much slower race than I wanted, and being in our self-named ‘vortex of fun’ for more than half the race was exactly what I needed to keep me from throwing in the towel or collapsing in tears at any point along the way. Meet up with Sharon, who finished with a solid time that was good for fifth in her age group! Meet up with Lashell – she had a strong run! In truth, slowing down was probably the best thing I could have done for my health as well; I was feeling lightheaded throughout the race (but I wasn’t dehydrated and I had been eating properly) and my breathing was a bit of a struggle. I am not sure, but I was thinking the pollen might have had something to do with the ‘thicker air’ that made it hard to breathe. After the race, someone posted a thank you on the event’s facebook page, thanking the person who had found her unconscious at mile 24.75 and called the ambulance. She said she had been treated for heat stroke, and that hit home to me how trying to go harder when you don’t feel well can end horribly wrong. I clearly wasn’t out there to win anything; my goal was to finish and have fun. I’m glad I was able to adjust my race plan and ensure the bigger goal was achieved. As we continued on, there was a man dressed as Santa holding a sign with the approximate distances on it – about 3/4 mi until the turn around. We waved and continued on, running past the turn around at the lighthouse, and when we got back to Santa, he asked where we were from. When we yelled out Florida and Cayman, he then asked ‘and you came here just for this race?’ with a bit of wonder in his voice. We yelled ‘yes!’ and thanked him for his encouragement. He then thanked us for participating in the event. This type of ‘thank you’ by a spectator happened about a half dozen times to me on the course. Justine and Katy heading up the final hill (Hell Hill is apparently what it is called) before going back into the US. Along the course, Katy and I ran on and off with a few others, sucking them into our vortex of fun for as long as they wanted to stay with us. We eventually picked up Justine around mile 18, and she stayed with us for the remainder of the race. Our trio had a great time, marveling over the beautiful scenery, chatting about life, trying to push each other when none of us really felt like it, and making the most of our time together. One thing I noticed at many water stops was the number of kids – from very young to teenagers -who were volunteering. Apparently there are 852 who live in Campobello Island (thank you Angela at Campobello Island Gifts for that little stat), and I am not joking when I said I think they were all out there volunteering or cheering on the runners. I loved taking cups of gatorade from the young ones, appreciated the two kids who were holding the hose to spray cold water on runners at one point and had a chance to speak with some older runners who asked about Hoss and why I was running in his memory. From start to finish, I felt like I was an extended family member who was there for a visit. Welcomed completely and shown a great time, complete with gratitude by the residents for taking time to come to visit. About mile 24, Justine, Katy and I were all ready to be done. We tried to pick up the running a bit more to get to the finish a bit more quickly. We still walked most uphills, and as we passed others (or they passed us) continued to offer those encouraging words. Heading back into Lubec, right before we crossed the bridge, my phone shut down completely, so I didn’t get as many photos from one of the most picturesque parts of the course as I would have liked. Luckily it rebooted in time for me to snap a picture of me with a foot in both countries, and as I waved goodbye to Canada, I had a little tear in my eye because another race was coming to a close. Crossing the Roosevelt Bridge for the last time, a cool breeze blew as one final exclamation point on the experience, and I marveled at the rush of water as the tide was going out. I don’t think I would have realized just how powerful that force is if I didn’t have the chance to run on foot. I was lost in my thoughts on this final downhill coming off the bridge, realizing that I was indeed a bit sad that my final spring race was coming to a close. No matter how hard a run is, it is always a little sad when it over. All the planning, training, anticipation – all about to be 100% in the rear view mirror. This wasn’t the race I wanted to run, but it was the race I needed to run. It was a refreshing chance to slow down and smell the lupine. I crossed back into the US to the cheers of the border agents, ran around the post office and saw the finish line in the distance. This last straightaway was lined with people – from residents to runners who had already finished. I heard Lashell yell my name, and soon after, the announcer welcomed me to the finish line. It was over. Marathon #14 in the books. The most difficult course I’ve done to date. My time was 5:17:54. This was not a chip timed race; rather it was by gun time so at best I was actually a minute faster. I laugh because this was only a couple minutes faster than the Marathon du Medoc, a race where I drank wine along the way. Immediately after finishing, a volunteer placed my medal around my neck. The handcrafted clam shell medal, strung with nylon rope used by the lobster men was an absolutely perfect finish to this event. I love this medal. In fact, I love it so much, that I continued to wear it each day for the rest of the week. I grabbed my mylar blanket, met up with the girls (who patiently waited for me to finish) and we grabbed my requisite post race beer – a locally brewed Quoddy Head Red – before finding lunch at Cohill’s Inn. This beautiful weekend of celebrating our hard work, training and friendship was a success, and we happily posed for a symbolic picture with our medals before we headed back to the cabin for our showers and a rest. At the end of the race, I understand there was a raffle of locally made prizes (which we didn’t win) and food, but I believe it was gone by the time I finished. Dinner that night was back in Campobello Island, where we really compared notes about our experiences. All three of us, and the table next to us (the two sisters from Iowa that ran the marathon), to a person swore they would never run that race again. The course was just that difficult. By the next morning, Sharon, Lashell and I were already talking about doing it again. Apparently, running this race is like childbirth: the pain of the event is forgotten and all the good feelings surrounding it overwhelm the senses, making you remember the good parts that much more strongly. And there were a lot of good parts to this race. overall, this race was an incredible representation of the people and of the area. I can’t believe I’m saying this, but I would absolutely run this race again. The race was fantastic, well organized and an extremely beautiful course. But more importantly, I’ll remember the beauty of the people as they welcomed so many to their small towns, made us feel at home and helped us to understand what up east hospitality truly is all about. Don’t let the hills deter you from experiencing this event. Just adjust your expectations for a good time rather than a fast one. You won’t be disappointed. Tank you for coming and Lubec/Campobello would love to have you return. HI Robyn, I’m just finding your blog, and so grateful for the time we spent together enjoying this marathon!! So funny, but I even see we crossed paths at the lobstah dinner 😉, as I’m behind your group there with my family! I love following your big hearted adventures on social media, and please know you are in my prayers! Best post ever. I want to run this marathon in 2019, I think. Sounds rather scary with so many hills! But you made it sound possible. Thanks. You can absolutely do it! One step at a time! The experience of the weekend is well worth the challenge of the hills (keep in mind I live where it is completely flat so I get no hill training at all). Just take it in and have a great time!